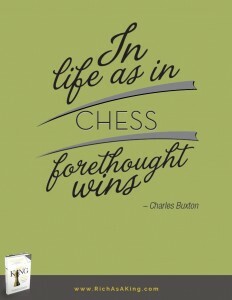 Letting emotions interfere with decision making is a common cause of mistakes… both on the chessboard and off. Why is it a problem when your emotions interfere with decision making? Let’s imagine the following scene: In a game of chess, your opponent moves his queen into a square that is exactly diagonal to your bishop. You didn’t expect this, and you are very excited at the thought of taking the queen. The rush of excitement at taking this important piece stops you from thinking straight –what you didn’t notice was that by so doing, you opened a pathway that threatens your king. Not only that, but your opponent’s knight was just waiting to take your bishop. What you thought was a brilliant move turned into a disaster: You lost a major piece and put your king in check! Since you didn’t take a critical moment to think, your emotions swept you away, taking control of your actions. As a result, you lost the game. The same concept applies to finance. If someone offers you a seemingly amazing financial opportunity, don’t let your emotions agree before you analyze the deal. Stop and think. What are the risks involved? Could you tolerate the loss if it turned south? A few moments of forethought and analysis could save you from a financial disaster. Douglas Goldstein, co-author of Rich As A King:How the Wisdom of Chess Can Make You A Grandmaster of Investing, is an avid chess fan, international investment advisor and Certified Financial Planner (CFP®).